It's so lovely to see you with your bright, shiny faces! And lots of you have inky fingers and glittery bosooms, too!! That's the way we like it! We had a quiet Labor Day weekend staying inside where it was cool. Our temperatures are finally dropping, but the skies are still really smoky from all the fires blazing throughout the western United States and Canada. It seems ridiculous to ask this, in light of the horrendous rain that fell in Texas and Louisiana (and now with incoming Hurricane Irma), but please pray for rain -without lightening - to fall where the fires are raging. This simple classic hydrangea is dressed in a style that could have been made years ago, except for the pierced scallop edging which adds a modern touch. I like how the rounded edging mimics the blossom clusters. It would pair well with a crisp Pinot Grigio. 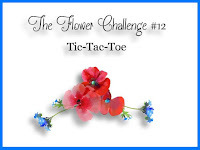 The Flower Challenge: Tic Tac Toe: Sentiment/CAS/Blue. Less Is More: Royal blue and lime green. Hammy has been good at reminding me to use my patterned paper more often and my next set of cards features pp predominately. Ooh-la-way-to-go! Isn't that a fun pp design! I've had it forever. I think it might be from DCWV. I've also had the NBUS shoe stamp for a long time and I'm happy to finally ink it up. It is from STAMPlorations and it was designed by my friend Shirley Bee (The Bee's Knees). The NBUS sediment is from The Alley Way Stamps. It's hard to tell from the photo, but the paper has embedded glitter and the shoe and sediment are stamped and cut from metallic paper. I'm not sure why this happened, but IRL the blue metallic paper is the same color as the blue in the pattern. Promise. I liked it so much, I made two more. The above pp showcases bobby pins. Raise your hand if you know what bobby pins are! Oh, good, most of you have at least heard of them! I don't even have any in my junk drawer any more. The spark for my shoe cards came from seeing that my friend Linda of Lin's Craft Corner is the September GD for Just Us Girls. Congratulations, Lin! 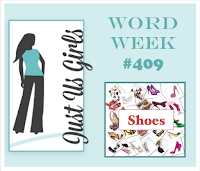 This is Word Week and the word is ... shoes! I'm also heading over to Pixie's Snippets Playground because I've used lots of snippets like a good girl! 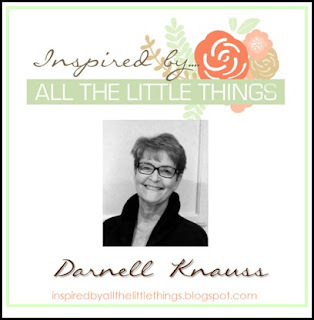 You might see my mug up on the Inspired By All the Little Things blog today. Most of you know that Blogland's venerable Queen of Challenges, Lesley Croghan, recently had a wee baby girl named Maeley! Lesley would like to spend as much time as possible with Maeley, so she asked me if I would take over her Admin duties for the Inspired By All the Little Things challenge. Always one to recognize how short life is and how fast children grow, I was happy to help a girl out! As one of the administrators, I will host the challenge one week each month and introduce a guest card artist. (Love this idea of Lesley's!) In addition, Lesley has put together a remarkable Design Team to provide you with fantastic inspiration each week! The Inspired By All the Little Things Challenge has been on summer break and will return this Saturday, September 9th. I hope you will come by to see who my guest artist is and play along with the new challenge! See you on Saturday! Thank you!! Great minds think alike I see! The 2 of us combined the same 2 challenges to create gorgeous cards! Congrats with the new position at "Inspired"... can't wait to be inspired by you and the team! Congratulations Darnell! I did see your pic over there. Can't wait to see your new challenge. Your cards are absolutely beautiful! Love them. It's very sweet of you to help out. I know it's much appreciated. Love your cards, too. Especially the hydrangea. Fantastic cards Darnell, I really love the top card and the beautiful hydrangea. My you have been busy, the heat is usually a good excuse for going indoors and sneaking a bit of crafty me time, 2 foot thick walls keeps out much of the heat so long as I remember to close the curtains and blinds! What beautiful cards Darnell and I dont know how you do it ...you always make me smile!!! Congrats with your new position at "Inspired by all the little things", well deserved!!! Love all your array of cards, they are so creative! The hydrangea is beautifully coloured and is one of my fave flowers. I must say that actual shoes don't really 'do it' for me - odd for a female I suppose but there you go. However you've done a grand job with these shoe themed cards. I do know what bobby pins are although here they were known as kirby grips, can't recall seeing any for ages though. Clearly there is nothing wrong with your mojo. I've alway loved that Hydrangea especially in the color combo you've chosen. The scalloped border IS the perfect touch to set it off. Shoes and patterned paper...who'd of thought they went together so well. Great way to reduce a stash, as well. Always loved that shoe of Shirley's. Reminds me of Candie's (bet you don't remember them). I haven't seen a bobby pin in ages, now that you mention it. Congratulations on you administrative gig...just know, with your obvious organization skills, that you'll be a winner at that, too. Darnell, that hydrangea is gorgeous. And so glad you joined in Jugs this week. What fantastic shoe cards. Thanks for the shout out. We had ashes falling down yesterday like snowflakes. We all definitely need rain. I just LOVE how you've colored that pretty hydrangea! Your shoe cards are quite remarkable and I've never been able to understand how anyone could possibly walk in shoes like that, but they are pretty to look at :) Congrats on your upcoming administrative position! I know you'll do well :) Wishing I could send you some of this rain we've been having all day today..........momma nature has her own plans I suppose. I love reading your posts darnell ! Loved the Beautiful blue hydrangea card simple and uet effective design .And pps well we all want to use them up..they are never ending supplies I guess ;) Your cards with shoes look pretty .will surely check the blog ,congrats ! The hydrangea card is stunning, I just love those colour tones! My, oh my, I cannot imagine wearing shoes like that but they sure look good on on your cards and those design papers are the perfect accompaniment! I love the depth of color in your hydrangea. I like all the cards, I have been trying to use more patterned paper too. It can be really fun and it feels great to use up a pad! Sure hope the places that need rain get it, including Australia which is gearing up for a bad and early fire season. Oh-la-la is right Darnell!!! Beautiful cards......as always! Your hydrangea card is beautiful Darnel, such lovely colouring and the scalloped edge is vey pretty. 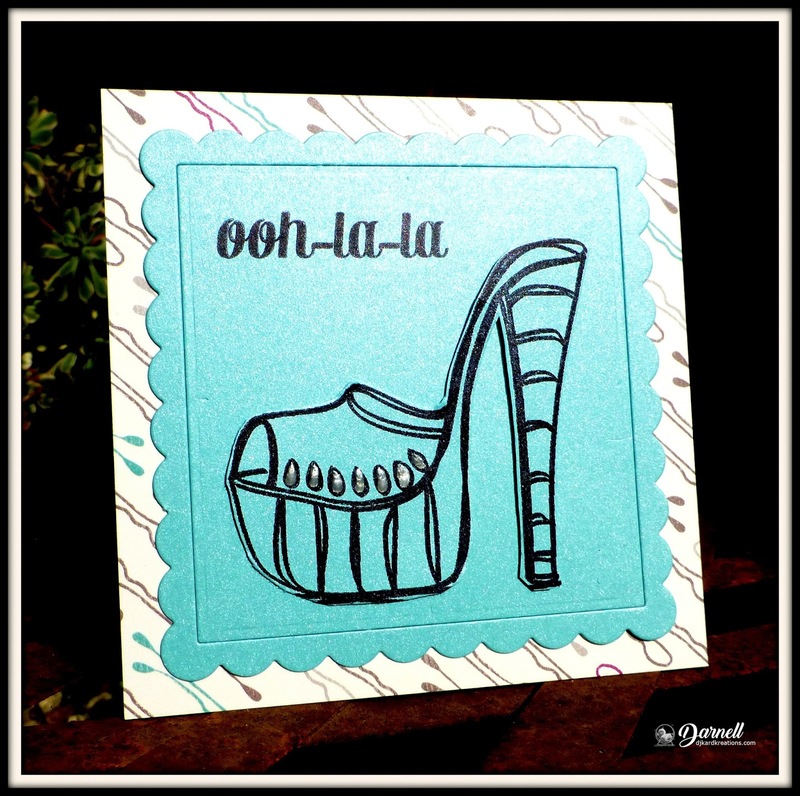 The shoe cards are great fun and I love the glittery backing papers. Your hydrangea card is so, so lovely and vivid. And for the girlie cards--the recipients will love and cherish them. 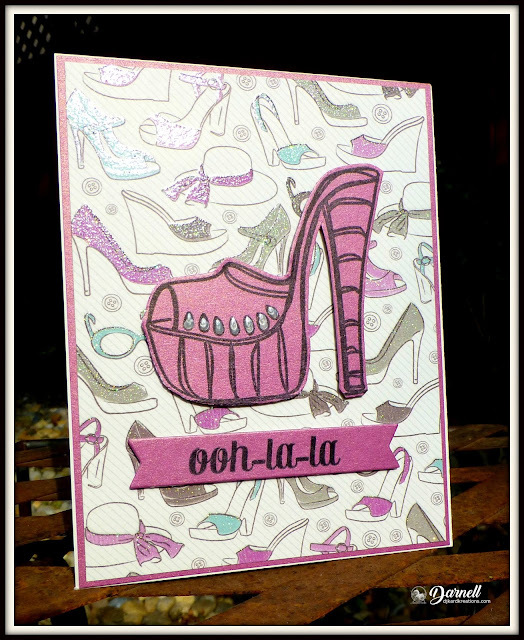 Two great cards - love the hydrangea one, and the shoe ones are so much fun. Congrats on joining the team at Inspired by All the Little Things! Totally gorgeous first card, love all the blues and the scalloped die. As for the shoes, I had a couple pairs very similar design back in the 70's, how the heck I walked in them I have no idea. Love the background papers of the first two and the third card looks just as cool on the plain card. First of all, Congratulations on your appointment at Inspired by All the Little Things, Lesley couldn't have chosen a better substitute ! 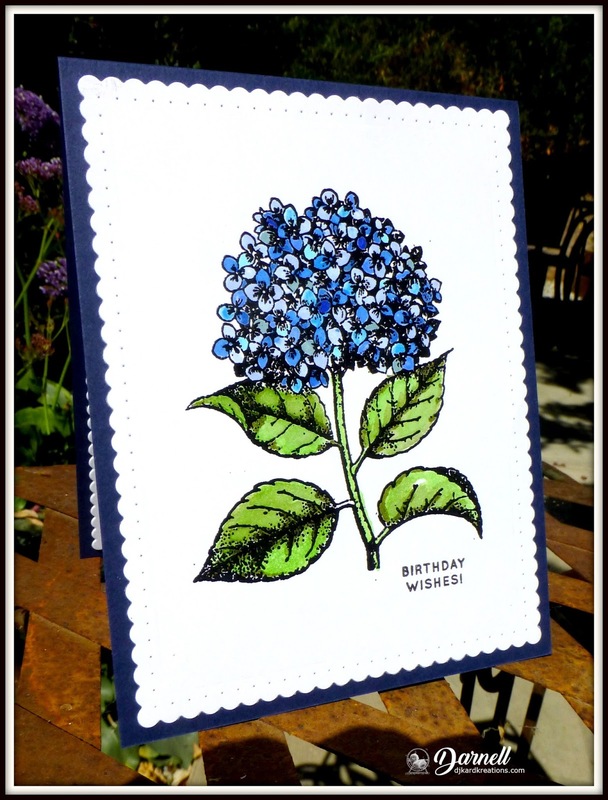 Love your hydrangea card ! Hydrangea is my favourite flower, just as blue ! Love the stitched scalloped panel too ! And ooh la la, j'adore your shoes ! I want the same one ! Thanks so much for sharing and for playing along at Less is More ! Congratulations Darnell! I wondered when we would see you as a designer. The cards today are lovely (#1) and charming (#2) - like you. Now that summer is over and the boys are back to school and I am no longer needed for babysitting I hope to do some challenges. I know your next NBUS challenge is coming up soon and boy oh boy so I have stamps. Just because I can't make the time to create a card I can still shop on line. Stay coooooool. The hydrangea is indeed a classic card! The shoe ones are more frivolous and there is nothing wrong with frivolity. I can tell you that today I feature a card with shoes for a card with shoes swap I did. Turns out I have a drawer of stamps labeled "Clothes and shoes" but there aren't actually any shoe stamps in there. I know I used to have some but I must have purged them. Luckily! I could fake it. Fake it 'til they promote you as grandmaw used to say. All your cards are so wonderfully done. You have so much talent and it is not surprising that you were asked to take on a new position for your friend so she can spend time with her new little one. I am sure you will be a great success too! No doubt about it! Oh I do LOVE a nice hydrangea stamp and yours is just beeeeeutiful. Gorgeous colour and love your scalloped background. Looks like we were both in the groove with our shoe cards this week Darnell. Love them and I can see all the lovely shimmer. Congrats on your new 'job' helping Lesley out. Sure am looking forward to what you have for us on Saturday. I am just in love with your gorgeous hydrangea! 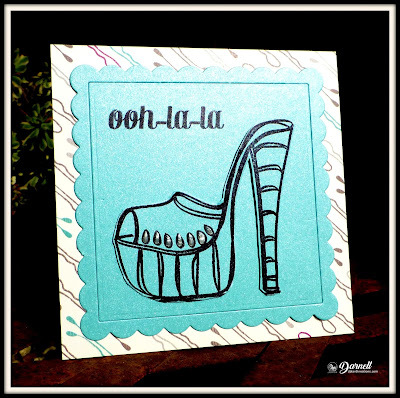 And, love your fab shoe cards Oh la la- tres bien!!! Yes, I do know what a bobby pin is : ) lol Congrats on your new DT- will have to check it out!!! A beautiful hydrangea with the matching scalloped edges! And I love those fantastic shoes! Wouldn't it be fun to be able to wear high heels again. Oh, wait, maybe you still do. Oh, I like that pretty hydrangea Darnell! Those swanky shoes look terrific on your cards with the fun PPs. A BIG congrats on your new gig! I have no doubt you will do an amazing job! Looking forward to seeing your GDT work in a few days. First congrats and great that you are on the DT! Super that you do this! And I love that hydrageana card (the ones in our garden get their autumncolours now)! And I'm glad to see all the beautiful cards you've created. Congratulation on the DT slot! Love your cards - that show is so dramatic, and I have used it too - not to such great effect as you have though, these are marvellous. Glad to hear Hammy is being helpful with his suggestions :-) - are you sure he has not run off with the bobby pins? Gorgeous cards, as always, Darnell. And congrats on the admin spot. I'm hoping my crafting mojo will return sometime soon so I can start posting to my blog again. Love all of these cards Darnell! Giggled at those shoes, I'd look like Mrs Doubtfire if I even attempted to totter along in heels like that! Wait, what - did you say I already DO look like her? Harrumph! Hmmm... I recognize that hydrangea from somewhere. Do I have it? Love how you gave it the perfect blue shading with your coloring. And those shoes... ack! So cute with the paper! Oh, my, getting ultra-retro with the bobby pins. I sure do remember those. Pin curls? Sheesh! You'll do a great job at Inspired By. I see their challenges and want to play, but honestly I'm overwhelmed by all the challenges out there. I need to pick a couple and just stick with them. And, yes, I never wished so hard for rain. Definitely without lightening. You have out done yourself Darnell! Those trio of shoe cards are fabulous! Not to mention that beautiful Hydrangea. You wouldn't catch me in a heel that large or I would be 6'6''. LOL I really love it in Pink. Thrilled to have you in our gallery at Just Us Girls! HUGS too! 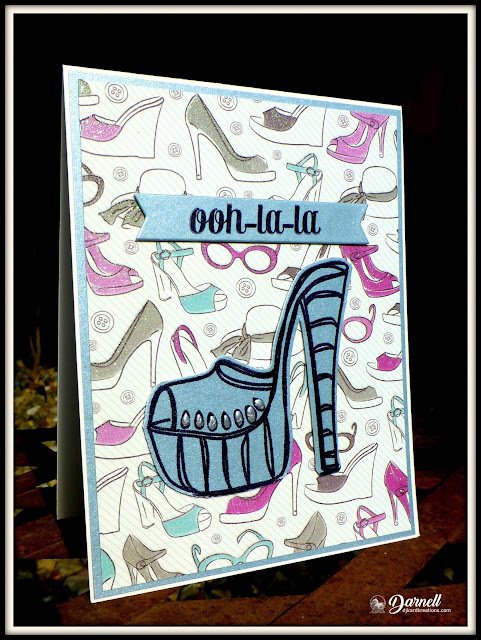 Gorgeous hydrangea card and darling fun shoe cards! Congrats on the new DT gig! That's a great challenge blog! And I love the groovy shoe! I think I had a pair like it once! And I have a bag full of bobby pins! Haha! Thanks for playing with Just Us Girls! Love the hydrangea its a fantastic card. Your shoes are so much fun as well. Congrats on the IBS team, looking forward to see Saturday's posting. pay the challenge a visit this weekend for sure. Ooh la la, those shoes look fantastic with the background papers! I love the colouring on your hydrangea (the ones in my garden are lovely shades of pink with a hint of purple). Congratulations on your admin role at Inspired By - I'm sure that with Hammy's help, you'll be invaluable to Lesley. Gorgeous hydrangea; amazing shoes! How cool that you had the perfect background paper! I remember wearing high heels once upon a time; now I've 'downgraded' to my wonderfully comfy, not ooh-la-la-in-any-way Sketchers *grin* As for bobby pins *waving hand wildly* I know them well; in fact, I have a couple here, somewhere. My niece also has some; all part of her 'pin her hair up in a bun' for ballet lessons. Yayyyyy that you're joining the Inspired By group; you're such a gem for helping Lesley out so she can spend time with her precious little girl. You're right: kiddos grow up way way way too fast! Congratulations on being on the Inspired By All the Little Things team. I'd love to turn my hydrangeas blue instead of pink. I know it has something to do with the PH in the soil and I'll figure it out some day. Meanwhile I'll ogle yours as it is gorgeous. And those shoes. My, my, what tall heels you have. I used to have some similar to those back in the day. Congrats on your new assignment at IBATLT. I've taken a peek and seen you first guest. Great choice! Your cards today are beautiful, but those shoes would definitely be the death of me. One step in those and I'd fall down and break both my legs. And I'm sure l would never recover from such a serious injury, let alone look stylish. But I still love those cards! What a beautiful hydrangea and what gal doesn't like shoes? I should use my patterned papers more so thanks for the reminder. What a good egg stepping into the crafty breach! You had a hard time, Darnell. So many beautiful cards in one post :-) I love the first card, because I really like hydrangeas. I love their mixed colors, as if they were painted with watercolor. Your next cards are real works of art. I love the colorful panels that you pumped. They look like design paper. Great, very feminine cards! I have that exact same DCWV patterned paper stack and I can't believe that all this time I didn't realize the one pattern consists of colored bobby pins! I absolutely remember bobby pins, and in fact still have some tucked away here and there in random drawers. I thought that pattern was just some random design but now I'll be looking at it in a whole new way. Just shows there's more to be seen and learned in this world...sheesh. Now I need to pull out my Girlie DCWV paper pad and dig around for a shoe stamp image (which I know I have around here somewhere), while your inspiration is still tickling my fancy. Love these fun cards!